The Figure It Out Workbook is an essential companion title to the best-selling Figure It Out series. Combining enriching content from the three previous titles in this series, this handy, travel-sized workbook is filled with step-by-step tutorials for figure-drawing practice. Chris starts with the basics of drawing the head and facial features, then moves on to lessons in drawing the body, keeping proper proportions, body dynamics for creating true-to-life poses, and much more. Each lesson in the book includes blank pages for drawing practice, giving readers an immediate outlet for honing their figure-drawing skills. The workbook's clever, top-spiral binding allows each lesson to remain in view above the blank drawing space so that users can easily follow along wit the tutorial as they draw. Chris will include a guide to drawing correct body proportions on the inside cover as a quick reference as well. 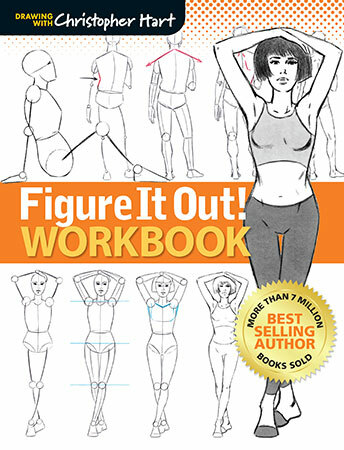 As both an introduction to figure-drawing concepts and a refresher for more seasoned artists, The Figure It Out Workbook is an engaging resource for anyone eager to pick up a pencil and start drawing. Paperback • 6.5 x 8.75"